We desire to impact our community through Music Therapy Services. High school can be difficult, but for a teenager with special needs, there are many more obstacles that can affect his/her success in a classroom. A person with special needs may have trouble processing academic concepts, processing directions, working well in a group setting, or staying on-task. Research suggests that music therapy is indicated to promote skills needed for success in the classroom. In an article on the effectiveness of a music therapy social skills program in a private school, music therapists focused on integrating peer-relations and self-management skills into the classroom (Gooding, 2011, p. 440). Just as it takes time to establish a new habit, it takes time to learn social skills. Research shows us that learned social skills are more likely to grow with evidence-based programs such as music therapy. When desired skills are rehearsed and reinforced, they are likely to occur more often. Music therapy interventions such as movement to music, improvisation, or problem solving provide students opportunities to interact with peers and reinforce appropriate social skills (p. 444). Results from this study indicate that there were improvements in social competence in adolescents with social deficits (p. 440). In this particular article, the students attended a school designed to meet their specific needs, but there is also research on the use of music therapy in public schools. The benefits of music therapy have been documented to reduce severely inappropriate behaviors, increase on-task behaviors, and teach social skills (Presti, 1984, p. 118). Music therapy interventions were used to provide opportunities for successful achievement of both behavioral and musical goals. For example, group cooperation skills may be targeted through playing a tone bar song together. Each student has a tone that corresponds to different parts of the song. On their own, it may seem like just one note, but together, they each contribute an equal part to the ensemble. If a music therapist was working on improving turn-taking skills in a group at a high school, he/she may use an intervention such as instrument soloing. Music can structure a turn-taking task by aloting turns for each student to play individually. Music is naturally rhythmic, so there is consistency to both waiting and playing. The structure becomes expected, which can decrease negative behaviors while increasing cooperative behaviors. Whether it be in private or public schools, already existing music therapy programs are providing musical experiences to work toward a common goal: success! Music adds motivation, structure, and consistency to tasks. Wanted behaviors increase when they are reinforced over the course of time. When group cohesion and on-task behavior become consistent in the music therapy setting, these skills inherently become more consistent in the classroom setting. In this way, school music therapy programs are indicated to make the tough high school years less of a stress and more of a success! Gooding, L. F. (2011). The Effect of a Music Therapy Social Skills Training Program on Improving Social Competence in Children and Adolescents with Social Skills Deficits. Journal of Music Therapy, 48(4), 440-462. Presti, G. M. (1984). A Levels System Approach to Music Therapy with Severely Behaviorally Handicapped Children in the Public School System. Journal of Music Therapy,21(3), 117-125. Transitional academies are community-based educational programs, usually provided in school systems, for young adults and teens with cognitive disabilities. These programs help students who have completed their academic courses make a smooth transition into the community. The academies provide training for a wide variety of student needs from activities of daily living and basic social skills to specialized vocational training and job placement. Music therapy services can offer holistic support of transitional academies through evidence-based intervention programs. Gooding (2011) reports utilizing programs that teach using evidenced-based programs and programs that provide “instruction, rehearsal and reinforcement” , such as music therapy, have a higher success rate (p. 441). Music provides a non-threatening, yet structured program to teach social skills for daily living because music is fundamentally social. Music promotes “interpersonal skills, teamwork, and co-operation” because it is created to be shared with others (Gooding, 2011, p. 442). Evidenced-based music therapy interventions, such as social story songs, allow for social skills rehearsal. Interventions focusing on interpreting or analyzing social situations (i.e. emotions, conversation cues) build social competence and give students not only the appropriate skills, but the motivation to use them in a given situation (Gooding, 2011, p. 441). Music Therapy services target many fundamental areas of social competence. However, an important fundamental to note is focus of attention as many persons with cognitive disabilities have difficulty with attention control (Gooding, 2011, p.442 & Pasiali, LaGasse, and Penn, 2014, p. 335). Results from a study by Pasiali, LaGasse, and Penn (2014) showed that music stimuli provided motivation for children to focus (p. 336). The “structure and predictability” provided by chants, rhymes, and songs “facilitates motivation to build attention skills” in addition to social skills, both components needed for joint attention (Pasiali, LaGasse, and Penn, 2014, p. 338). This study indicated that music interventions supported the development of higher level cognitive and auditory processing, useful skills in finding and using cues in the environment (Pasiali, LaGasse, and Penn, 2014, p. 338). The most important aspect of music therapy in conjunction with transitional academies is the adaptability of evidenced-based interventions. A board certified music therapist is trained to “create developmentally appropriate music-based experiences” to promote successful social and vocational training experiences for students at any level of ability (Pasiali, LaGasse, and Penn, 2014, p. 338). Gooding, L.F., (2011). The effect of a music therapy social skills training program on improving social competence in children and adolescents with social skills deficits. Journal of Music Therapy, 48(4), 440-462. Pasiali, V., LaGasse, A. B., and Penn, S., (2014) The effect of musical attention control training (MACT) on attention skills of adolescents with neurodevelopmental delays: a pilot study. Journal of Music Therapy, 51(4) 333-354. Hello, my name is Alyssa Taylor and I attend William Carey University in Hattiesburg Mississippi. During my time at William Carey I worked with a variety of populations, but the populations that I connected with the most were adults and adolescents. Working with these populations in a college setting helped me figure out which direction to go in when choosing an internship site. For this reason, Therabeat stood out to me the most because of the wide variety of populations they serve. Having the opportunity to be an intern at Therabeat inc is a dream come true. I can remember my sophomore year of college stumbling across Therabeat’s Instagram page and just falling in love with the sweet kiddos and the passion the therapists have for music therapy. I wish I had words to describe how special In Harmony is as a whole. All of the therapists have been so welcoming to me these last two weeks and I have loved getting to observe all of the different therapies in action. I have also enjoyed the opportunity to meet so many sweet kiddos and their families. I am so thankful that I get to be a part of their lives during my music therapy journey. I am so excited to be on this journey at Therabeat and I will be forever grateful for the opportunity they have given me to grow and learn. During these first two weeks I have gotten to observe therapy sessions, co-treats, and even piano lessons. I have enjoyed every second of getting to watch our clients learn and accomplish goals in a session. Something I am excited to explore during my internship is the importance of self-expression within a music therapy session. As humans, we all have the desire to be heard and understood, so music is a healthy outlet for that desire. Patients in sessions often come in right after a long day at school, which means the child could be tired, angry, happy, or sad. Also, patients with special needs have other things that might frustrate them that could also add on stress. Allowing a child to write a song, or have an improv session about his/her day is a great way for patients to release tension and express feelings appropriately. The elements of music--rhythm, dynamics, timbre--are what make it such a great tool for self-expression. Music can be played loud, soft, fast, and slow which makes it a gold mine for self-expression with children with speech related challenges, as well as children who are verbal. I look forward to doing more research on the benefits of self-expression and the different ways it can be used in a music therapy setting. My name is Anna Carter and I am excited to say I am one of the new music therapy interns! I am coming from the University of Georgia, and I like to say I am completing “phase 2” of this whole college thing here at Therabeat. During my time at UGA, I had many opportunities to work with a wide variety of populations. However, while working at Extra Special People, I found I have a very special place in my heart for children and adolescents. During these past few weeks at Therabeat, I have already begun to feel at home. I have been soaking it all in through observing many music therapy sessions as well as occupational, physical, and speech therapy. Using this time to form new relationships with the kids, I have already learned so much about them and how I can meet their needs through music. For example, I am learning the importance of knowing and using sign language for children who don’t necessarily have a hearing impairment. Sign language can be a great outlet for non-vocal and non-verbal children to express themselves. By learning sign language, we can be better equipped to create an environment for any child to express themselves. One thing I can speak strongly about in my experience so far is versatility. Having seven music therapists to observe as well as all the gracious occupational, physical, and speech therapists, I get to see many different styles and methods everyday. There is also versatility in music therapy settings. Not only do I get to work in our amazing new clinic, but I also have had the opportunity to go out into the community at some of the off site places. Every day is a new day at Therabeat, and I can already tell that no two days are ever going to be the same! Hi everyone! My name is Holly Huggins. I hail from the University of Georgia--Go Dawgs! My hometown is a quiet little town called Fitzgerald, GA. During my time in school I worked with a number of populations, but I have most enjoyed the energy and joy that comes with working with children! My time at Therabeat, Inc. is the final stretch to my board certification and official graduation! The past couple of weeks have been an amazing whirlwind to say the least. I have been observing and introducing myself to all the talented staff at In Harmony Pediatric Therapy. I have had the privilege of meeting the patients and their families and caretakers. I am beyond blessed to be a part of their lives for even this short amount of time. I am so excited to see all of the growth and milestones that each unique patient will reach. During the winter recital, I had the pleasure of watching so many of these patients showcase songs and dances that they have been working on since September. In some of these performances I had the best seat in the house, the stage beside them. Seeing the joy radiate from them and transferring to the audience is something I will never forget. Hearing one of my kiddos exclaim “that was so great!” after his dancing and singing act, watching the two members of Rock Bottom clap for themselves after another successful gig, and many more little moments wrapped up to the fact that I got to be a part of that moment with them. It’s a privilege that I do not take lightly. All of that being said, the experiences I have had during my time here have proven to be once-in-a-lifetime learning opportunities. I understand in greater depth the importance of addressing the sensory needs of a child, I find myself surprised by the talent and ability of the patients I see, and continue to learn to never underestimate any of them. I look forward to cherishing every moment that I have in this clinic. In this time of reflecting on what we are thankful for, Therabeat Inc. and In Harmony Pediatrics are both at the very top of my list. 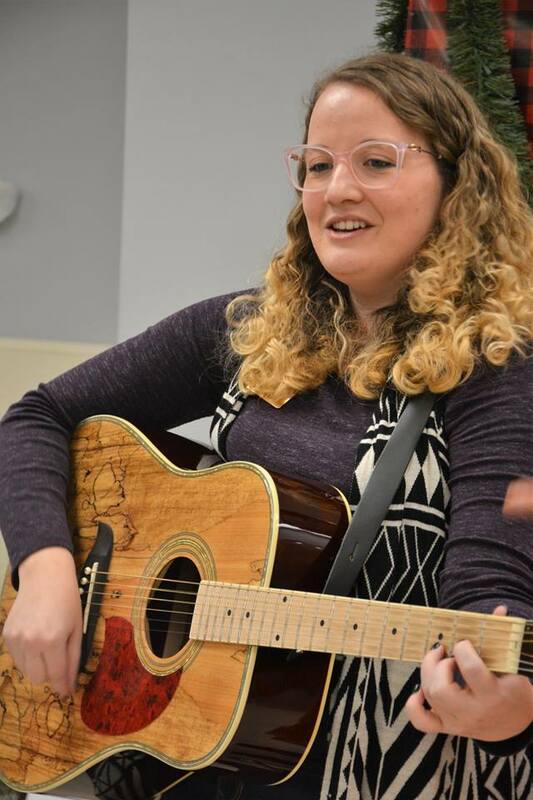 Holly Huggins, Music Therapy intern.